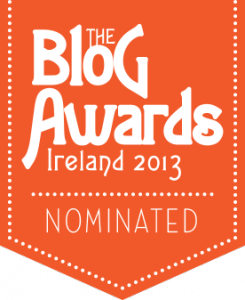 I’m delighted to say that Social Web Thing has made the prestigious Blog Awards Ireland ‘long-list’ in the ‘Best Personal Blog’ and ‘Best Technology Blog’ categories (‘Best Blog’ and ‘Best Blog Post’ will be announced at a later date). Both lists contain some really strong competition from a whole host of prominent and influential bloggers, so I’m sure it’s going to be a close run race. On a personal note it’s always nice to gain recognition for something which started as a hobby, but very soon developed into a passion. I’m thrilled to be in the running. For those unfamiliar with the awards they look to bring together, recognise and celebrate the diverse range of bloggers within Ireland or those with an Irish connection. I’m also pleased to say that my employer, Chill Insurance has made the cut and been nominated for ’Best Group Blog’, ‘Best Corporate Blog’ and ‘Best Mobile Compatible Blog’. The ‘long-list’ will be shortened on 8 September 2013, with the actual winners being announced on 12 October 2013 at the Osprey Hotel in Naas, County Kildare. I’ll be keeping my fingers crossed until then and with a bit of luck, i’ll be dusting off the old tuxedo for an enjoyable night at the awards ceremony.